He always loved fast cars. Unlike most people, Jim Galante can afford automobiles others dream about. At the race track his driver and crew live by his motto, “second place is the first loser.” When Galante, a New Fairfield resident, spent a few nights at the races more than a decade ago it’s no surprise he wanted to get involved. The racetrack offers a chance for employees and customers to see the race car. Unlike others, Galante prefers no advertising on his race car. “At 120 miles per hour you can’t read the names of the sponsors anyway,” Galante said. Instead, sponsorship for Mystique can be found on a giant billboard on the backstretch of Stafford. Christopher, a Plainville native, has had a similar passion for cars, only he prefers to be on the speedway. Unlike many modern professional drivers, Christopher was not exposed to the sport at an early age, nor did his parents have an interest. He raced go-carts toward the end of his high school days through age 25 with his brother Mike. They traveled all over the country, paying for all their races themselves. Mike raced for Galante before Ted took over. Although racing is practically a year-round sport, Christopher will race most of his 101 features this year from April to October. He drives a modified, or open-wheeled, race car at Thompson Motor Speedway on Thursdays and at Stafford Motor Speedway on Fridays – the two main features throughout the year. After thousands of races in practically every car and competition imaginable, Christopher acknowledges money affects racing. The Mystique race team has been so successful that winning has become an expectation, not just a goal. Christopher’s laudable driving career includes: 77 victories at Stafford, the most by any driver; a National Championship in 2001, beating over 2,000 drivers from about 90 tracks across America; and a competitive desire that makes him willing to take risks many drivers won’t. They recognize Stafford fans are more opinionated – both in favor and against – toward them than other race teams because of their success. Galante said he enjoys when the fans boo because he knows he is winning, but gets annoyed when people say his team cheats or doesn’t deserve the win. After thousands of races, Christopher seems unfazed before or after races. He sometimes sits in the Pits before a race wearing blue jeans and t-shirt, cracking jokes. It’s a big change from when he built his own racing motor for eight years. Galante and Christopher credit the crew for much of these accolades. Many of the members work at the race shop, also the location of Christopher’s transmission business in Plainville – MNT Enterprises. Others pay their way into the Pits – a parking lot area near the racetrack where the cars are adjusted before the race – to volunteer assistance or support. This is a place where fans like to see the cars and drivers in-person and sometimes take photos or voice their opinions. Before they load the black, blue and silver No. 13 race car into the jet-black 35-foot trailer, the crew goes through its routine check – tires, nuts and bolts, etc. The crew has become so accustomed to the track that adjustments during practice runs and before the feature are second nature. For instance, they know if it’s hot outside, the track is slicker, forcing them to lower the panhard bar so the rear tires hug the asphalt. Even with a dedicated race team and an owner like Galante, who is willing to fund the best parts and several standby cars, the driver has to sacrifice. One weekend before Christopher won the National Championship in 2001, he stayed up all night fixing his crank shaft after getting back to the shop at 2:45 a.m. from Stafford. As Christopher says, “Effort equals success,” or in this case: 49 straight hours awake equals two wins. As Christopher and Galante know through experience, even possessing the best equipment with a talented driver and crew, anything can happen on the race track. “When we lose and have a bad night I don’t have to say anything because no one is harder on them than themselves,” Galante said. 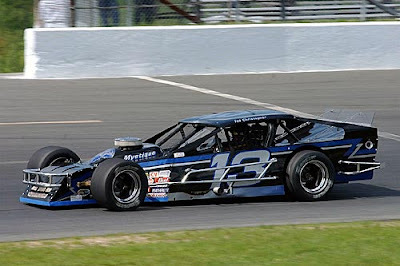 On Friday, June 6 at Stafford, Christopher was in second place for the entire second-half of the 100-lap race only to have the distributor screws loosen with five laps to go. But the crew had no time to mope. In less than five hours they’d be up before the sun, heading to a race in Long Island. Although rain was in the forecast, skipping the race never entered their minds. They only thought of winning. This story first appeared in the Danbury News-Times. I didn’t have to ask Ray Bardis, a former PGA Tour caddy, many questions. Instead, he just told me one story after another at the Stamford Senior Center in Connecticut. He filled in many of the details so I wouldn’t even call it an interview. It was one of my first stories I did while writing for The Stamford Times in the summer of 2003. After we chatted for a couple hours, we had a putting contest on the Astro Turf putting green which overlooked the bustling city of Stamford. Ray Bardis has a memory like a steel trap, or maybe that’s a sand trap. Bardis, a 64-year-old former caddy to stars such as Sam Snead, can close his eyes and remember shots and yardage from matches that took place 40 years ago. Briskin was televising a celebrity tournament between Jerry Lewis and golfer Sam Snead. On the par-five first hole, Bardis told Snead he had caddied at Bel-Air for five years. Snead made it clear he expected him to know every shot on the course. He also told Bardis, just once, how far he hit each club. With Snead’s drive 180 yards from the pin, Bardis looked away and prayed after handing him his 5-iron. Snead placed it 12 feet from the hole and two putted for birdie. He birdied the first three holes and finished the front nine at four under par. The Snead story is just one of hundreds he’ll retell down to the club, distance and even slope of the green. As a professional caddy, Bardis worked five to six days a week for 32 years, greeting pros in parking lots in hope he could carry their bag and earn a living. Commitment to a single player or sacrificing for a big name golfer didn’t suit his personality. While playing golf has always been more fun for him than caddying, the latter paid his bills. Growing up in Los Angeles, his father taught him how to caddy at age 8. Little did he know seven years later his son would think about doing it for a living while caddying at Hillcrest Country Club in Los Angeles for a $2 double-bag round. Even after his parents initial apprehension, Bardis never second-guessed his decision to travel across America, hustling for a tour bag. It was his calling. When he decided to skip school to caddy in his first professional tour event, the 1951 Kansas City Open, his teacher told him he didn’t know anything about golf. Bardis says a caddy’s most basic responsibility is finding the golf ball. One afternoon in 1962 at the 207-yard seventh hole of the Desert Inn Golf Club, a golfer in Bardis’s group took out a 3-wood. “If you hit that stick, you’re going to hit those mountains (in the distance),” said Bardis, who never liked to advise another caddy’s golfer. Bardis watched the golfer switch to his 4-wood. He saw the ball hit the top of the bunker, kicking up sand, wind down the apron and into the hole. No one believed what Bardis thought he saw. After searching the bunker and rough, they finally checked the pin. The ball was in the cup. His reward: six silver dollars. While he had to earn every dollar in his pocket, his talent as a caddy enhanced his reputation over time. A member at Annandale Golf Club in Pasadena, Calif., named Dave faced a wall of trees with his ball in the rough 205 yards from the flag. Bardis recommended his Ping 7-iron. Dave said he would double his payment if the ball landed in front of the green and triple the money if it reached the flat surface. After Dave’s shot landed on the green, he asked about Bardis’s prediction in disbelief. From then on, Dave always sought him to caddy. By the time Bardis moved to Portchester, N.Y., in 1969, many pros knew his caddying capabilities – sometimes earning well-known tour bags in Florida during the winter. In 1977 a caddy named Cigar Hank carried Billy Casper’s bag, but said he didn’t want to caddy in anupcoming tournament in Hawaii. Bardis overheard the conversation, offering to take Hank’s place. Bardis paid $164 for a one-way ticket and got the job only to have Casper miss the cut. Casper found Bardis crying because he was scared Casper wouldn’t pay him enough to get home. In 2001 he met Casper at the Red course at the Doral Country Club in Miami, Fla., and Casper said, “I’ve seen you made it back already. You survived,” and they both laughed. Bardis also found a way to separate himself as a golfer. His playing partners watched him reach the green out of the rough or bushes, sometimes over 100 yards away, with his putter. There isn’t too much he hasn’t seen. He watched a professional caddy stumble headfirst into a sand trap. He recalls athletes from different eras that revolutionized their sport. The rule book has changed from 13 to 242 pages since he started as a professional caddy. Even at 64, Bardis acknowledges change. “I’ve seen all the greatest players that ever played in the world, this kid (Tiger Woods) presently playing now is something I’ve never seen in my life,” he said. “I don’t care about the pros,” Bardis said. He cared about the experience. This story first appeared in the Stamford Times in June 2003.